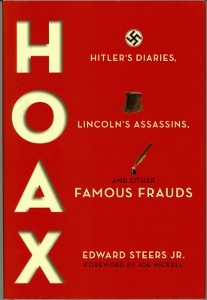 For his book, Hoax: Hitler's Diaries, Lincoln's Assassins, and Other Famous Frauds, Lincoln scholar Edward Steers Jr. asked me to write the Foreword, which I was honored to do. Published by University Press of Kentucky, 2013, Hoax examines such famous deceptions as the Piltdown Skull and the Shroud of Turin. As I say in part, "His is not just a presentation of great deceptions and a treatise on credulity; it is also an engaging seminar, both on how facts and falsehoods vie for belief and on the interplay of history and science."